At the back gate, the dog waits. It is 6:15pm in the optimistic Spring sunlight of a mid April evening, and Barney and Ludo are pottering past my front window on their way to the forest. Barney is a dumb blonde whom everyone loves, an exuberant white terrier-ball of fluff one couldn’t possibly hate even if one was a big fierce rottweiler. Barney would charm the birds out of the trees and then chase them happily, and the birds would like it. Ludo is a black miniature schnauzer. He has Scowl built into his DNA, and it is the base of his expression. He is officious, and disapproving, and sternly puritanical. Of course, I might just have made all this up. Appearances are not everything. It might be possible I was mistaken: were it not for the judgement of the watch-dog, the dog who lives on the corner of the path to the forest, the small hairy admonisher of all who enter there. I speak, of course, of Macaulay the Dog. 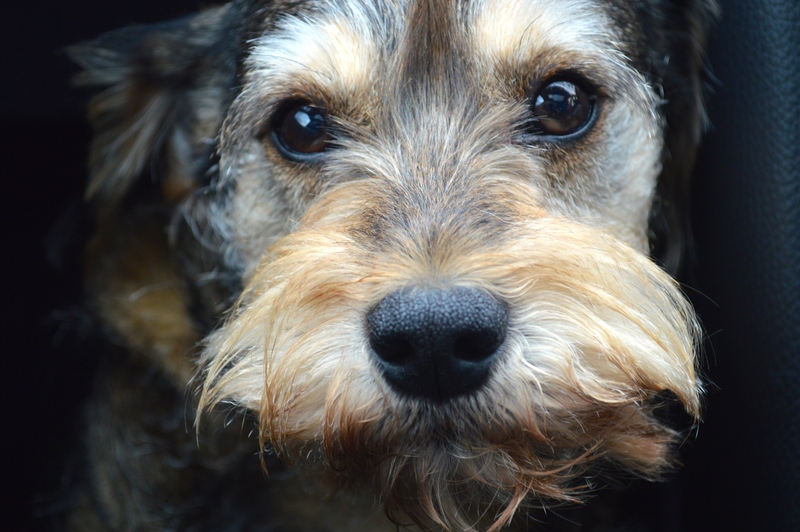 Macaulay, the family hairy smelly terrier, is half schnauzer. He has the breed in his blood- it is what gives him that insane urge to tell everyone else what to do. And when he meets Barney, angels sing. He adores the little white creature who emanates the film-star quality of Tin-Tin’s Snowy. So perhaps it is envy which makes him bristle at the very sight of Ludo the Austere? To call the atmosphere awkward when the two meet on a walk is understatement. Had they been 18th century men, they would have challenged each other immediately to a duel. And indeed, perhaps they were, and perhaps they did, and have been sentenced to a canine skin in this life as a result. Because of this, Macaulay stands waiting in his metaphorical watchtower, a toll-collector scoping the road for stagecoaches and sundry wheeled vehicles who might owe him payment. But the dogs who must pass this way to get to the forest do not pay in coinage;rather, they must listen to our small dictator’s rhetoric, a Mussolini behind the garden gate. Macaulay waits for Barney and Ludo. Stolid, he stands there. And the minute the first ear appears round the bend in the path, he’s off. Barkbarkbarkbarkwoofwoofharangueharangue, and he doesn’t stop there, he shouts more and embellishes it, and I blush to think what it means in doggy language, as grim Ludo strains on his lead and wonders, somewhere deep in his doggy being, where his flintlocks are. It is but a moment. It does not take long to get past. But to Macaulay, it is sweet indeed. He turns away from the gate and looks at me as I scold him. What? he says telepathically. I grit my teeth. Time to fill a washing-up bottle with water once more. It is the only way to shut him up in full flow. Posted in Macaulay The Dog storiesTagged dogs, england, Macaulay, pets, UKBookmark the permalink. I would love to be able to read a dog’s mind. I’m delighted to see that Mac is feeling garrulous this spring. I’m sure he’ll be kept busy with increased traffic to HIS forest. Thanks for a fun share. Pleasure. Yes: he is looking forward to Spring and plenty of juicy rhetoric, Nancy. Mac takes his duties seriously and doesn’t understand your scolding! BTW my reader dropped you. Have you offended Word Press? I thought you stopped writing! Shame on them! Kate, WordPress and I are in negotiation. They insist I am now appearing in everyone’s readers; I insist I am not. My readership has dropped: I am a little frustrated. Thank you so much for coming along to read today despite my absence! You’re NOT in my reader either, Kate. I requested daily e-mail alerts so I can see when you’ve posted. You must have been a naughty girl! For some reason every year when the spring weather breaks I get a small dip in readership. It goes up again by summer. I can’t figure it out. Maybe WP does a house cleaning? Or people are joyously frolicking outside. Poor Mac, how he needs to be in charge. maybe you can arrange a playdate in the forest with the blonde bimbo? Not without Ludo. He is the Yang to Barney’s Yin. They are inseparable…. Hello, Jackie! Poor reggie. Not a fate I would wish on anyone. My only remedy is a squirty bottle of water. It does encourage terriers to be quiet. Long live Macaulay Shrewsday!! Such a personality. I’m glad he’s enjoying the debut of Spring. I hope the rest of the Shrewsdays are as well. We are, Andra: it’s the Easter hols here! Hope your feet are feeling less tender. It’s all in the job description. It is, Kathy. And he takes it most seriously. Mac and my childhood dog, Mean Streak, probably would have been great buds. Both territorial barkers with their dog pals and their dog enemies. Mean Streak also resented when we’d try to get him to pipe down. Many a time he gave us the classic hairy eyeball look. You haven’t shown up in my reader in weeks. This is ridiculous. I’ve been talking to WordPress for a little while now. They insist you can all see my posts. I’ve passed your comment on with all speed. Let’s hope they can do something: my ratings are looking a bit sad. Good! You might have to sic Mac on them. Kate, I just double-checked my reader . . . scrolling back to the 17th. This post is NOT there. I’ll leave you on e-mail alerts until you reappear in my reader. Oh, Kate – love this. Of course, Ludo and Mac must have been in a duel and are now, well, now Mac and Ludo. What an entertaining thought this is. Spring has finally arrived here (she said, with baited breath, for snow could still drop). Have a lovely weekend. And you, Penny. It is good to emerge from the cold months 🙂 Love to Tom. Hope all’s well. Our Bubba will bark as ferociously at any dog who dares pass by the front window…..and when the offender is gone, Bubba races to the back and barks just as ferociously out the back window at……at…..at…..nothing. Waiting expectantly for the offender to pass the back. Not a lot of thinking going on there. I absolutely adore the portrait of Mac. He’s so photogenic, with such an interesting face. But don’t tell him I said so. You’d never hear the end of it. I always love the way you bring the character from your canines. If only I could say I brought it out, Bronwyn: there it is, in spades, in all our faces. No deer parts this month, thank the good gracious Lord, Debra. But the cats are making up for it in mice. Oh Mac, you are just gorgeous 😀 I’d love to see your antics at the gate . . . but in the meantime, Kate, your photography is fabulous! Naomi, thank you! Though the subject really makes it with his louche poses. Can I tell you how in love I am with the idea of two 18th century gentlemen sentenced to live out a lifetime in small dogs’ skin? The idea of Ludo despairing of his dueling pistols makes me ridiculously happy. 😀 If you had seen them together the same idea would have occurred to you, Cameron. I am half sure that this past life theory of mine is actually true. If you have missed the writings of Ms. Kate Shrewday, you have a treat in store from Macaulay the Dog Stories to castles and priest holes to gorgeous photos of English nook and crannies… She is a treasure trove. Absolutely delicious writing! More please. Thanks 🙂 I have a feeling Macaulay the Dog will never run out of material. It’s diverting being his ghost writer. Maureen, she has a whole series on Macauley, the Dog – utterly delightful! Ah, Kate, that picture of Mac says it all. I can hear him from here. Perhaps it is because of Spring. Ella, the Greythound, seems to have her wires crossed. Ordinarily, greyhounds seldom bark. Not so Ella…. She seems to love the sound of her own joyous bark, particularly in the confines of a bathroom doorway. I tell her she’s a loudy and it is clear she thinks that is high praise indeed. Her tail goes helicopter and she springs in every direction simultaneously, kind of like an animated 4 Wheel Drive jeep being put through its paces. Ella has a full musical scale she works through from a soft moan-whine to rooing to the joyous barking. My, she’s a loudy! Tell Mac he’s not a alone in the forest. How kind you were to reblog this – thank you! I have to confess it’s one of my favourites of his so far, though a ne doggy politics development has emerged: a lady in white. Called Fou-fou. Kate, how could I not share your delightful stories?! So glad to see many of my buds coming to enjoy you! I absolutely love this!!! I am coming via Huntie at Chasing Rabbit Holes. I am now following your blog so I can read more now and in the future. Hi Kanzen, I’ve just popped across to see those delicious recipes of yours. Later, I shall pour a glass of something cool and read some poetry. Many thanks for coming along today! Please visit often and feel welcome. The door is never latched. Isn’t there an unwritten law somewhere where the little guy tries to appear bigger than he is? I love this little guy and we haven’t even met. I shall look forward to it. Thanks for stopping by: and yes, little guy syndrome is alive and well here in Southern England! Reading about Mac has all the myriad advantages of enjoying his finer points, whilst not being able to smell him, Wanderlust. Macaulay book and audiobook to follow shortly!